Love and marriage…and Synergy Print Design! Yes, when people think about getting married, they think of us. 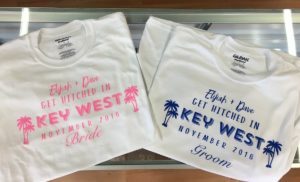 When a local couple began planning their destination wedding in Key West, one of the bridesmaids had a fun and creative idea: give everyone in attendance custom wedding shirts to wear around town as they celebrated with the newlyweds. The whole wedding party took their shirts one step further, adding their title to the bottom of their custom wedding shirts. Bridesmaids received a pretty pink print, while the groomsmen’s shirts were done in blue. These shirts are truly the gift that keeps on giving, since the the newlyweds and their wedding guests can wear them over and over to commemorate this special day. Some people get fine china, others get towels, this couple received the honor of having their entire guest list looking great in custom shirts as they made their way around Key West! No matter what the occasion may be, Synergy Print Design can help. If you’re looking for the perfect way to capture the celebration, let us know! We have thousands of unique ideas waiting for you to choose from. Click here for your free quote on custom apparel by Synergy Print Design.